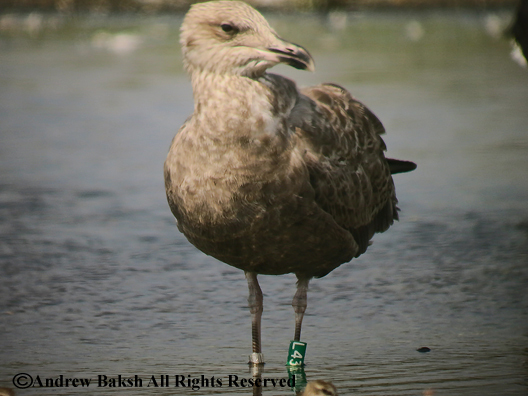 I like to share my banded birds information in the hopes of encouraging others to report any birds they see with a band. 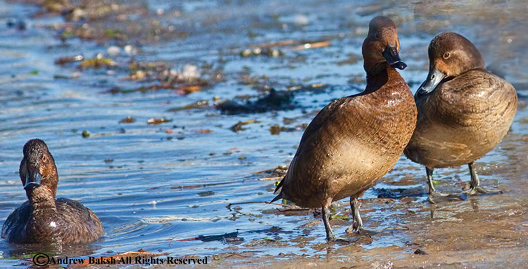 Reporting banded birds provides valuable scientific information as researchers use the sighting to map out the traveling/migration patterns of a banded subject. 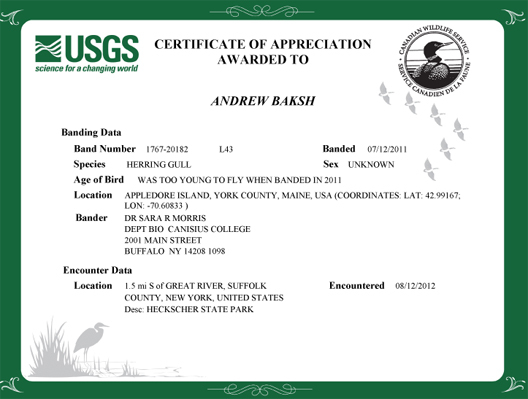 Here is some information I recently received on a banded Herring Gull, that I photographed at Heckscher State Park on Long Island back in August 2012. You may report a banded bird to Patuxent Wildlife Research Center Bird Banding Laboratory. Redheads are cool, you just have to find them! 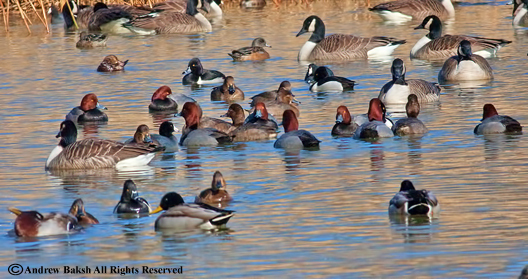 Oh my, look at all those Redheads - if you seek ye shall find! 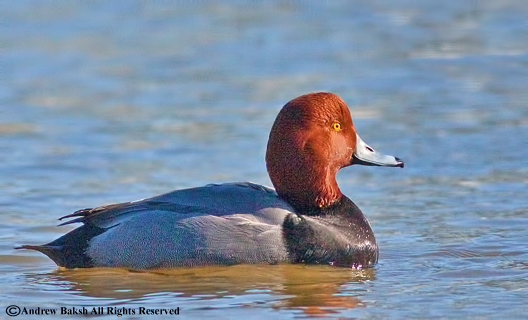 This female Redhead struts her stuff! 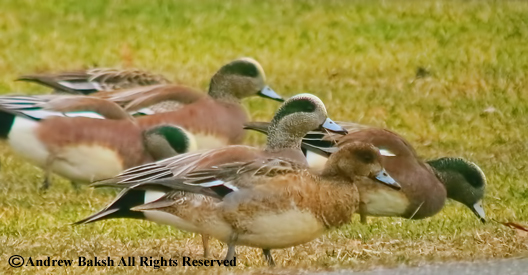 Recently, I had the good fortune of being able to study Eurasian Wigeons at the Sayville Golf course on Long Island. 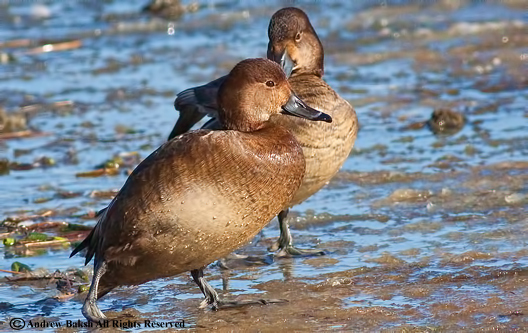 I had seen male Eurasian Wigeons before, but I was keen to study the females that were at the location since I had never had the opportunity to see them. 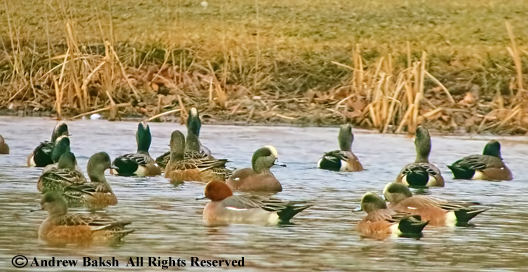 I took some time and studied both American and Eurasian Wigeons taking photos and making field notes. There are a some field marks that are commonly used in the field to aid in the ID of a female Eurasian Wigeon, but they are not always easy to see and so I decided to do a photo study and share my observations. First, the difference in head color. 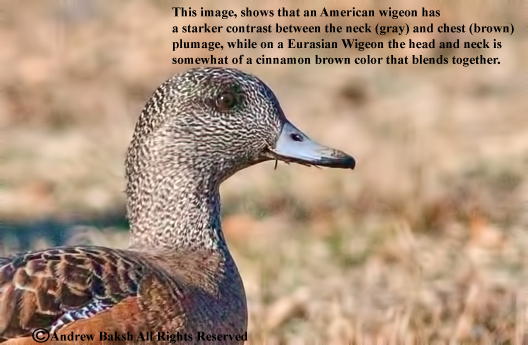 If we look at the female American wigeon, it has a starker contrast in its plumage between the neck (gray) and chest (brown); while on the Eurasian its warmer tone of a cinnamon brown color just blends the neck and chest together without the demarcation seen with the gray and brown on an American. A second field mark and boy is this one subtle. 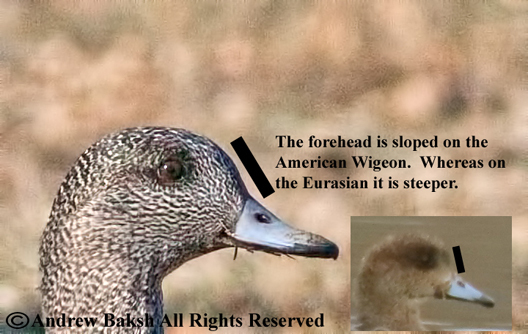 The forehead is steeper on a Eurasian and sloped on the American. 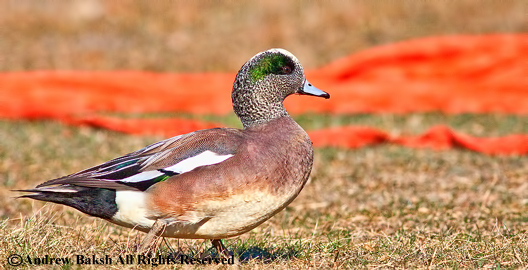 Finally, the gape (the base of the bill where the two mandibles come together) is black on the American wigeon and there is no black on the Eurasian. It is difficult to see that in these photos. 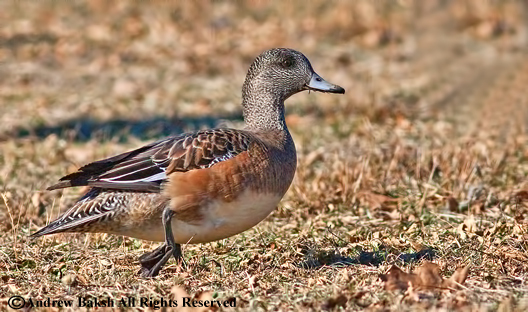 One sure clincher is the gray armpits in Eurasian which is white in an American Wigeon. Here are some photos showing the comparison. 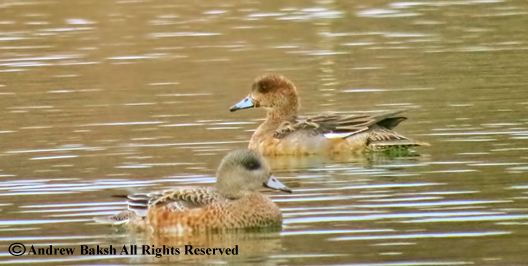 Can you tell which one is the Eurasian Wigeon? Oldies but Goodies at Montauk LI..
Last Saturday, I invited my friend Andria to join me for a nice leisurely day out at Montauk LI. There were several good birds still hanging around in Montauk and I thought it would be nice to get Andria some life birds as a thank you for her support in coming out to the Bronx on my Van Cortlandt Walk. Plus, who knows what "NEW" bird (s) besides the continuing goodies could one find out east. A trip to Montauk, is always an intriguing one. Heading out to Montauk, requires an early morning start, since it is a couple of hours from my place of abode and I tried my best to be sensitive to Andria who is certainly not accustomed to 4:00 a.m. starts, which is what I would normally do when going out to Montauk on my own. We ended up leaving after 5:30 a.m. not what I wanted but it was not too late of a start. 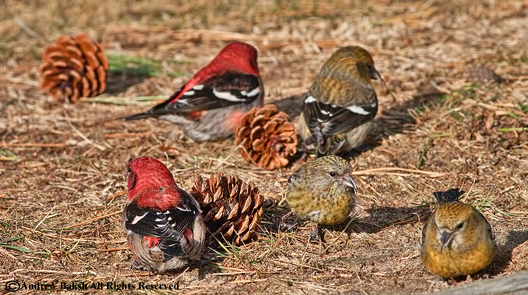 A sign of a good day in the making began at Kirk Park, where we enjoyed looking at a flock of White-winged Crossbills (Loxia leucoptera) feeding in the parking lot. White-winged Crossbills @ Kirk Park, Montauk LI. Next up at Georgica Pond, a search for Wilson's Snipe (Gallinago delicata) was a hit...when six of them flushed and flew out of sight. But we had a problem. You see, Andria did not get a chance to get on any of them and I felt at fault because I did not allow her to get into proper position before birds sensed me and flushed. I was annoyed with myself, but Andria was quite the good sport, willing to let it go and possibly hoping for another crack at another location. Unfortunately, giving up is not something I am good at especially when I am trying to help someone and Andria had to put up with me as we worked the area until I spotted a Wilson's Snipe on the far shore. I got it in the scope for Andria who enjoyed a lengthy study of an often hard to detect species. 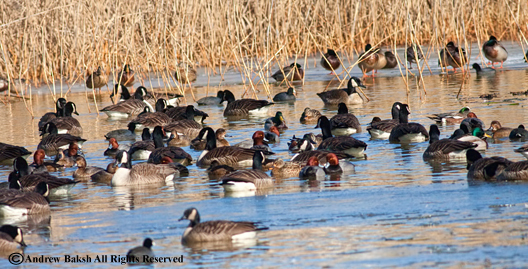 At the point, it was was uneventful with a disappointing lack of waterfowl. The number of Common Eiders was paltry less than 30. There was little to no flight and we did not stay at that location for too long. Our next stop was to check Montauk Lake for Black-headed Gull (Chroicocephalus ridibundus) and Barrow's Goldeneye (Bucephala islandica); both species were reported at the location and would be lifers for Andria. We got lucky with our first stop as we connected with an immature Black-headed Gull (just barely) as it disappeared just as quickly as we found it. We looked and were disappointed not to find the Barrow's, but just as we were about to leave I got a text message from Anthony Collerton (Mr. NY State Big Year Record Holder), himself. He had joined us and after we left him on the beach, he picked out a male Barrow's, making us hop out of the car and setup back again on the lake. This time we managed to pick up the bird and I allowed Andria lots of scope time to study the bird. After a while we moved on and headed to Montauk Inlet. The West side of the inlet was disappointing, but the east side hosted a continuing Kumlein's Gull as well as Sanderlings and we got our second look at a Bonaparte's Gull. 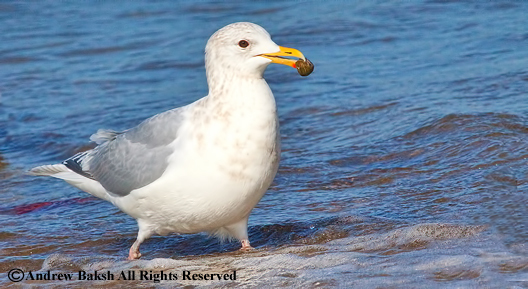 We spent sometime with the gulls, feeding and photographing the birds, but finally moved on. 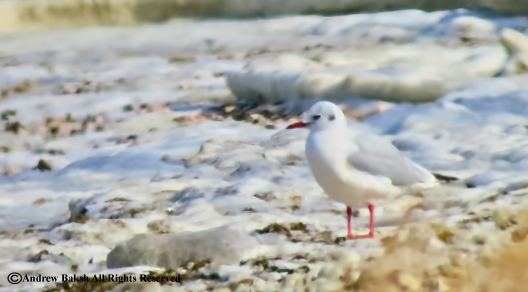 A second pass around Montauk Lake netted a surprising second Black-headed Gull, this one a non breeding adult. Trying to manage our time, so that we got in a few additional locations, we decided to skip the geese run and began our way back west with plans to stop at Nappeague. Our stop at Nappeague did not get us a Snowy Owl as I had hoped but Andria got her lifer Lesser Black-backed Gull (Larus fuscus), although I suspected a Snowy Owl would have been more exciting for her. From Nappeague we headed out to Dune Road. On Dune Road, it was not very active as far as birds but we enjoyed the species we saw including a female Belted Kingfisher that we pulled over to watch hunt, this was a treat for Andria who happen to list the BEKI as a favorite bird of hers. 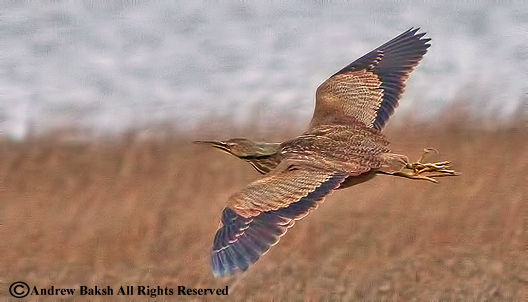 Later on, Andria skillfully picked out an American Bittern (Botaurus lentiginosus), against the reeds. Another life bird for her and a year bird for me. We called it a day once the light began to fade and it was two tired, yet satisfied and happy birders that made our way back out west from eastern Long Island.